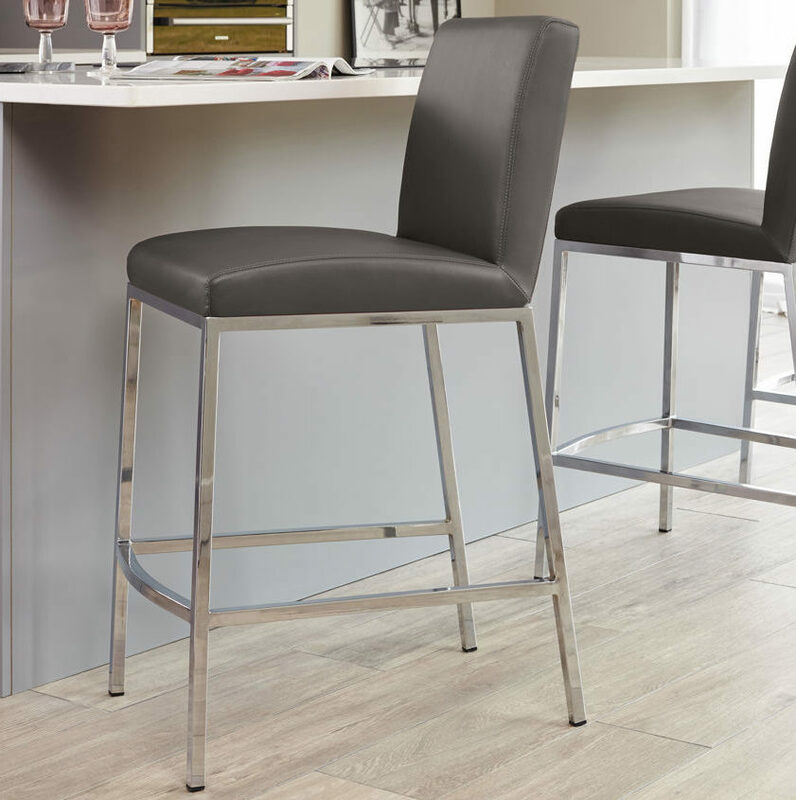 A staple seating choice in many kitchens and dining room interiors, a bar stool is no longer just a seat you'll find tucked around the bar at your local pub! Taller than your average chair, bar stools often have adjustable heights and a footrest to support your feet when seated. 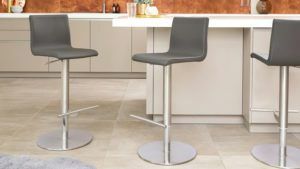 The height and narrow shape of bar stool seating have made them ideal for use at bars and at high tables in pubs, but in recent years bar stools have increasingly found a place in the home, generally around a kitchen island, counter or a home bar. 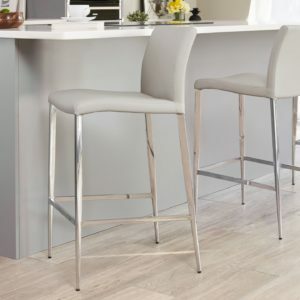 Wooden and metal bar stools, stainless steel and chrome styles, and adjustable height features are all very popular, so there are plenty of shapes and designs of bar stools to choose from. 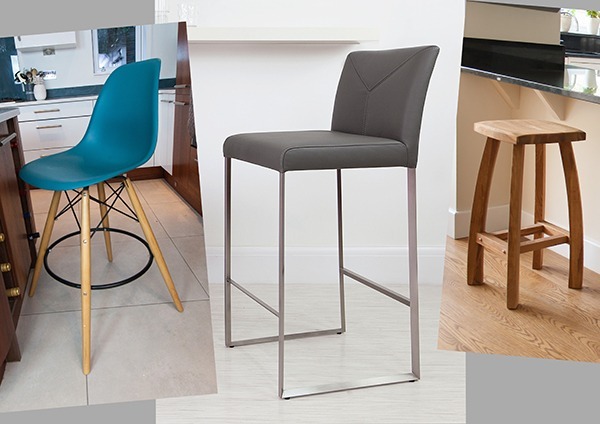 So whether you’re wondering how to style a bar stool in your home, what bar stool height is right for your counter or whether to have a fixed height or gas lift seat, you’ve come to the right place! This blog post, along with our handy Bar Stool Pocket Guide, is packed full of bar stool sizing and styling tips. So sit back and relax as we guide you on how to find the perfect bar stool for your home. 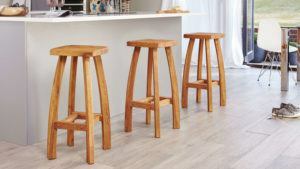 What's the Right Size Bar Stool for My Kitchen? 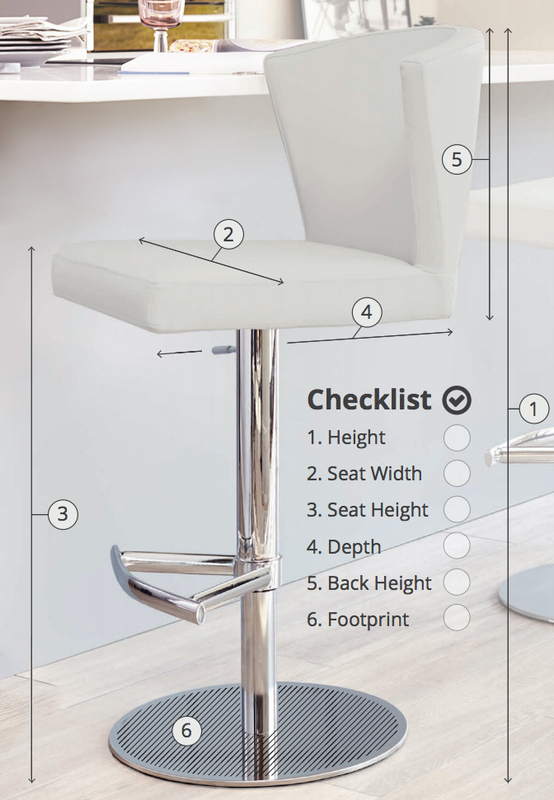 If you’re buying a bar stool online, most websites will list all of these vital measurements. However, if there are any missing there’s no harm in ringing up and finding out. It’s best to know your sizing before hand than ordering a bar stool that doesn’t fit! Top Tip: As a general rule, it’s best to allow about 15 cm between bar stools for a comfortable seating arrangement. If the stools swivel, you’ll need a little more space for the seat to rotate. It’s also a good idea to consider how often you’ll be using the stools. Will it be for everyday dining or special occasions and drinks with friends? This will help you decide what type of bar stool you need. 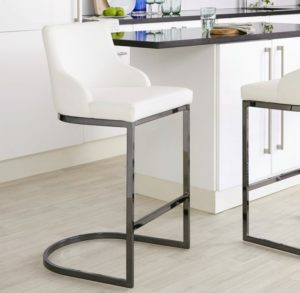 What’s the Difference Between Counter Height and Bar Height Bar Stools? 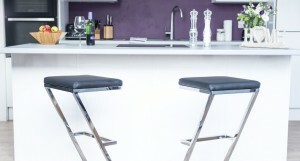 There are two main bar stool heights: counter height and bar height. Do check these measurements because they are different. 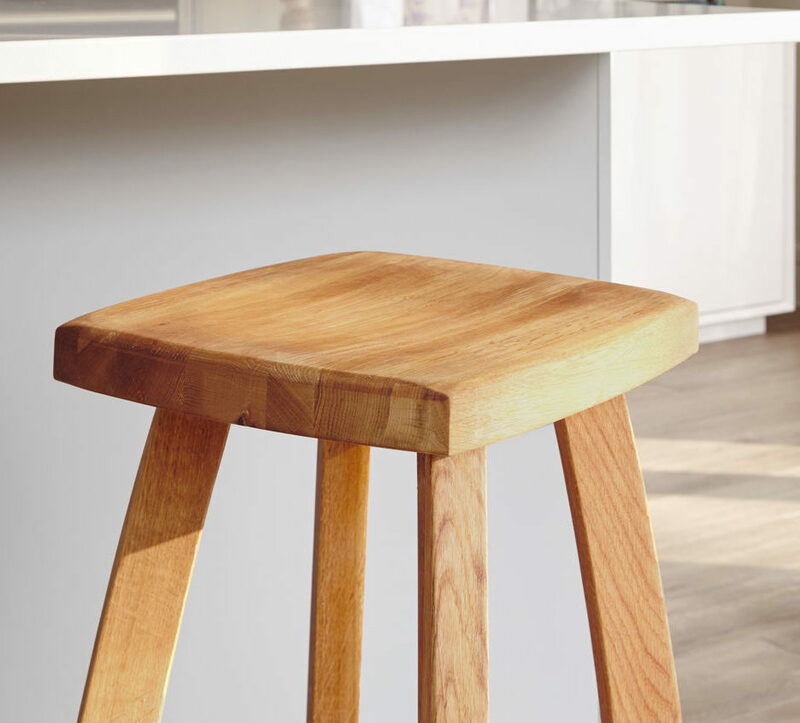 A counter height stool is more suited to a kitchen worktop counter and is generally 58cm - 71cm from the floor to the seat. This sizing means it should be used with a surface that is between 88cm - 93cm high. On the other hand, bar height refers to higher bar areas. A stool of this size is generally 73cm - 81cm from the floor to the seat. This should be used with a surface that is between 104cm -109cm high. Fixed Height, Gas Lift or Cantilever? 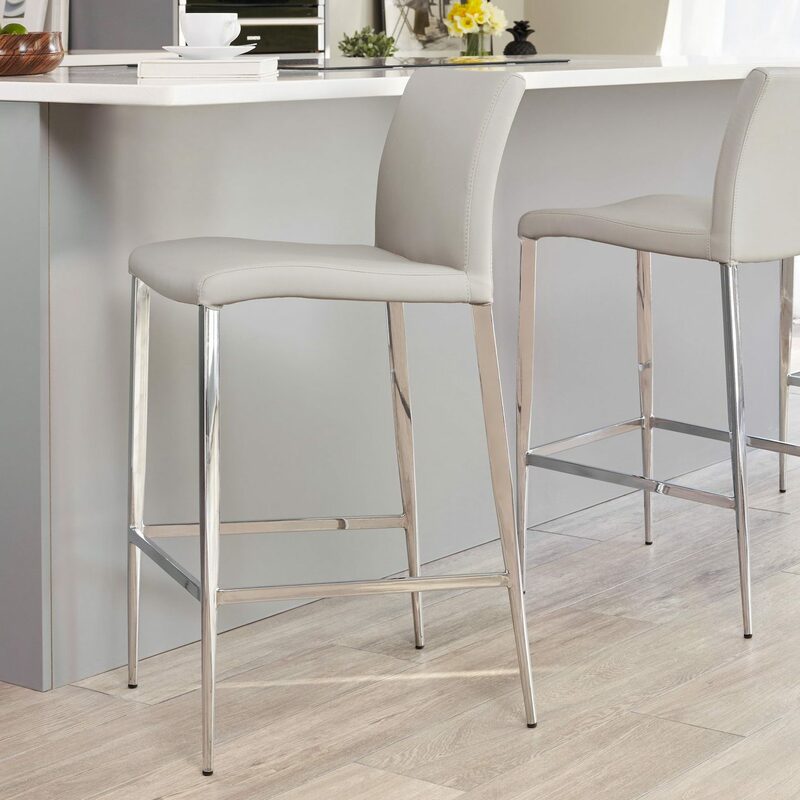 There’s really no right or wrong choice when it comes to choosing a fixed height, gas lift or cantilever bar stool, it’s more about what works best for you and your setting. A gas lift offers a bit more flexibility while a fixed height stool will help keep your space looking uniform. 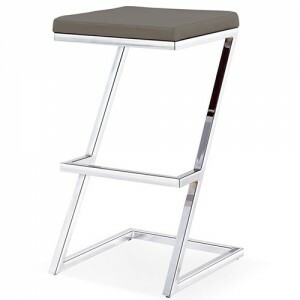 A cantilever stool is something a little bit different and will instantly add a contemporary vibe to your room. Here’s a quick run down of the features and benefits of each. The main benefit of a gas lift bar stool is its adjustability. You’re not set at one height so you have a bit more flexibility when it comes to matching up with counter heights. A gas lift mechanism also means that the individual sat on the stool can adjust the seat to suit them. 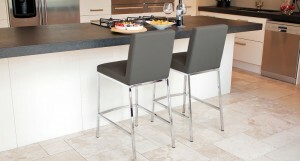 Top Tip: Gas lift bar stools are usually on a pedestal base. Remember to account for the stools footprint when you are planning out your space, as some have a wider bottom half. 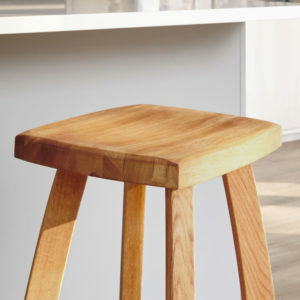 A fixed height stool does what it says on the tin: it’ll always be at a fixed position. This can be really beneficial if you can find a stool that matches your counter height, as you’ll have a seat that’s always at the optimum height and a comfortable position. Generally more lightweight than gas lift bar stools, a fixed height stool is also much easier to move and reposition around your breakfast bar or in your dining area. Top Tip: If you're sure you don't need the function and you are conscious of a budget, save yourself a few pounds and stick to a fixed height rather than gas lift stool. Okay so cantilever bar stools technically come under fixed height stools, but we thought this seat deserved a special mention. Unlike a fixed height bar stool, a cantilever base will provide a gentle bounce when seated. It’s not as much movement as a gas lift, but it’s enough to add an extra bit of comfort. A cantilever stool is great for opening up the area around your breakfast bar, so consider this if you’d like to create a really clean and spacious look. This is because cantilever stools have less of a visual impact so free up lots more space. Top Tip: A stool with a flat front, such as our Form Chrome Bar Stool, can sit close to the panel of a breakfast bar when not in use, keeping the area looking effortlessly sleek and neat. 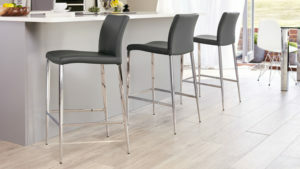 What Style of Bar Stool Should I Choose? A bar stool with armrests will offer that extra bit of support when seated. It also offers a more encompassing seat sit that is super supportive. Often bar stools with armrests have a deep seat which creates such a generous and luxurious feel. 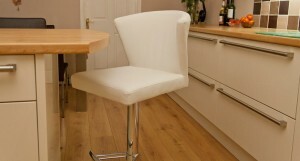 This will allow friends and family to sit comfortably on your bar stools for even longer. 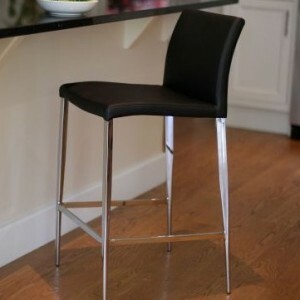 A backless bar stool can neatly be tucked under your counter or breakfast bar making it a great space saver. A backless seat will also have less of a visual impact in your room. 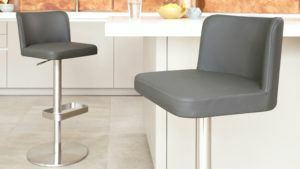 If you’re after more support, a bar stool with a backrest of 30cm or more is ideal for lumbar support and added comfort. A bar stool with a footrest will offer that extra bit of help getting onto the stool and will also provide a place to comfortably rest your feet when seated. There are loads of different styles available so it’s best to think about what will work within your interior. 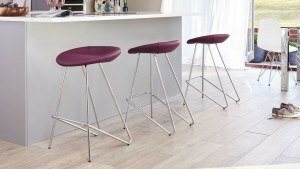 What Material Bar Stool Should I Choose? 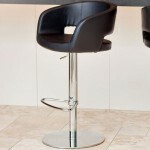 Easy to clean and maintain, faux leather bar stools are usually available in a whole variety of colours. Faux leather is a little lighter on the purse than real leather so this might be a better option if you’re updating your home on a budget. GREAT FOR - easy cleaning and everyday use. 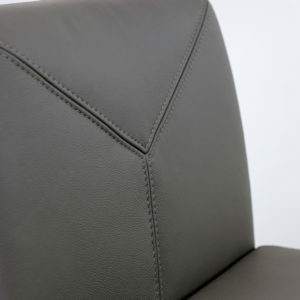 Faux leather is a really popular material choice as it’s ideal for seating that’s used every day. HOW TO CLEAN - Use a damp microfibre cloth and a mild detergent such as washing up liquid. Regular cleaning will help to prevent a buildup of surface marks. You’ll really feel the difference when you’re sat in a real leather bar stool, and it’s strength and durability means that it has great longevity. What’s more, this stunning material actually gets better with age. GREAT FOR - style and longevity. At a slightly higher price point, a real leather bar stool is an investment piece. If you spend a lot of time in your kitchen and want to create a “heart of the home” kind of feel, it’s definitely worth buying the best you can afford. HOW TO CLEAN - Use an absorbent cloth or sponge to wipe the affected areas. If you really want to give your leather some TLC, it’s worth investing in a leather maintenance kit which will look after the leather before, during and after cleaning. Perfect for families, a plastic bar stool is so easy to wipe clean. Plastic bar stools are usually available in a range of colours so are a great opportunity to inject some colour into your space. An oak bar stool has such a wonderfully warm and tactile quality and is ideal for adding a really welcoming and homely feel around your breakfast bar. GREAT FOR - Adding an element of texture to a modern kitchen or coordinating with a slightly more traditional or Scandi inspired design. HOW TO CLEAN - A regular light dusting with a soft cloth will remove any dust or bits caused by everyday use. 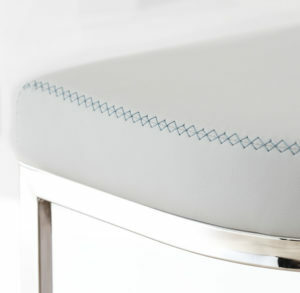 When it comes to cleaning, wipe up any marks immediately with a soft slightly dampened cloth. We advise that you don’t use household cleaning products unless they are specifically designed for use on real oak furniture, as they can potentially damage the wonderfully smooth surface of the oak. What Material Base Should I Choose? A chrome bar stool will add a really modern and contemporary feel to your space, due to its bright and reflective quality. GREAT FOR - creating a really modern and bright look. If you have chrome finishes in your kitchen or dining chairs, it’s great to tie all the elements together for clean and coordinated look. HOW TO CLEAN - Use soap and water on a soft cloth. You can always add a splash of vinegar to give your cleaning an extra boost. Don't use abrasive cleaners on your chrome bar stools as any scratches caused can potentially expose the material to the air and cause rusting. Slightly more subtle than chrome, a brushed metal stool will provide a great coordinating feature, helping to create a seamless and contemporary vibe throughout your kitchen or dining area. GREAT FOR - Coordinating with brushed elements in your kitchen. The matt surface of brushed metal is a little easier to maintain than chrome as it won’t show up fingerprints as easily. HOW TO CLEAN - For every day cleaning and non-stubborn marks, you can simply use some hot (not boiling) water and a cloth or sponge to wipe over your stainless steel furniture. You can always add a little bit of washing up liquid if you cleaning needs and extra boost. Stay away from oven cleaners or products that contain chloride as this will damage the surface. A dark luxe take on a regular chrome finish, black chrome has such a luxurious and almost mysterious quality about it. Opt for black chrome if you’re after a more subtle alternative to silver chrome or if you want to create a really on trend look. GREAT FOR - creating something a little bit different. Black chrome is a great choice if you don’t want a completely matched up look, or you if you already have too many other finishes to try and coordinate with. HOW TO CLEAN - Use soap and water on a soft cloth and if the mark still doesn’t go away, we suggest using a splash of vinegar to give your cleaning that extra boost. Waxing chrome after a good clean is also very useful if you want to keep its high shine for even longer. So there you have it, a complete guide on how to choose the right bar stool for you home. Not all bar stool’ed out just yet? Great! Now you know all the insider info on how to choose the perfect seat, why not head over to our website and see what great bar stool varieties we have to offer. If you’d like to print our bar stool sizing tips, you can also view our Bar Stool Pocket Guide. Want to read more Danetti Guides? we also have a handy How To Guide on Choosing Your Perfect Dining Bench. Now you know how to choose the perfect bar stool, we’d love to see the results! Whether you’ve long since been a fan of bar stool seating, or are having a mini home makeover, tag us in your pics on Facebook, Instagram and Twitter. Don't forget to use #mydanetti. So, you want to buy a barstool? Well, I’m not surprised, bar stools are big news! As we change the way we live, new styles evolve and right now there is a huge desire for open plan living - and following very closely behind is the increasing trend for stylish bar stools. Families especially are enjoying being together in one big space in a room that multi-tasks. This newfound love of communal space is a far cry from previous decades where there was a dedicated dining room, virtually unused, that sat by day like ‘a shrine to dine’ gathering dust until it was needed for the next dinner party. For at least the last ten years, more and more people are opting for a one space living area that contains a dining table, tv area, and a kitchen separated by….. a breakfast bar complete with bar stools. 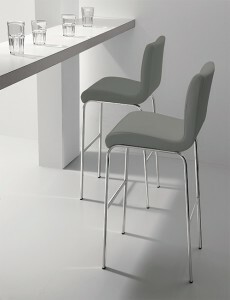 This new found love of the bar and bar stool is easy to explain - its sociable! Even with all the other places in this one big space to sit, you will find that families and friends will choose to perch at the bar. Providing the perfect hot spot for eating, watching TV, doing homework or chatting over a glass of vino - you can’t beat the informal ambience of propping up the bar! 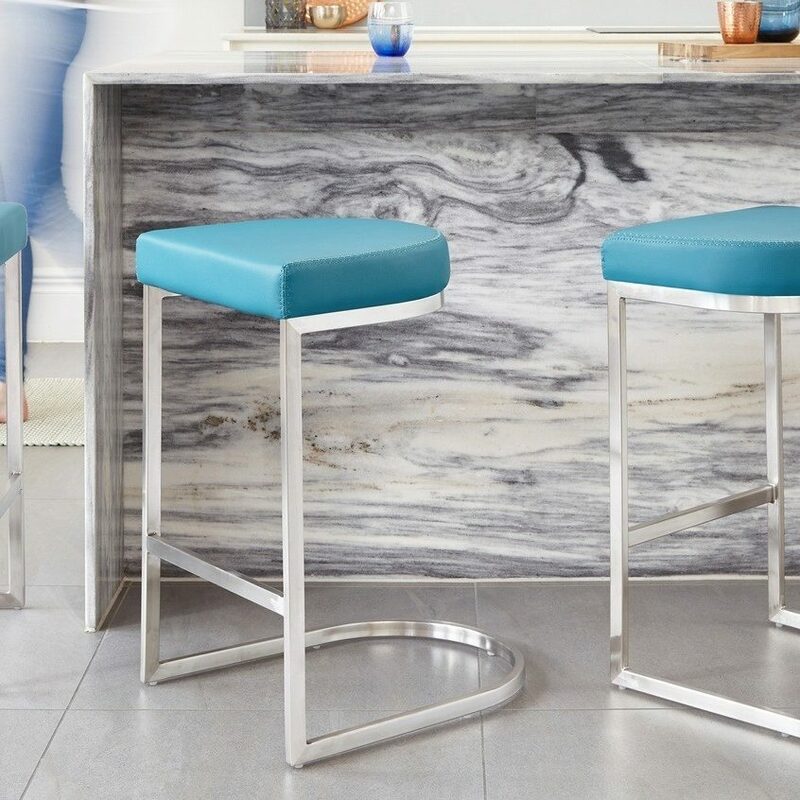 Well, now you know you want some bar stools - ask yourself the following questions and use our tips to make the right choice for your space. Are your bar stools for a family room? 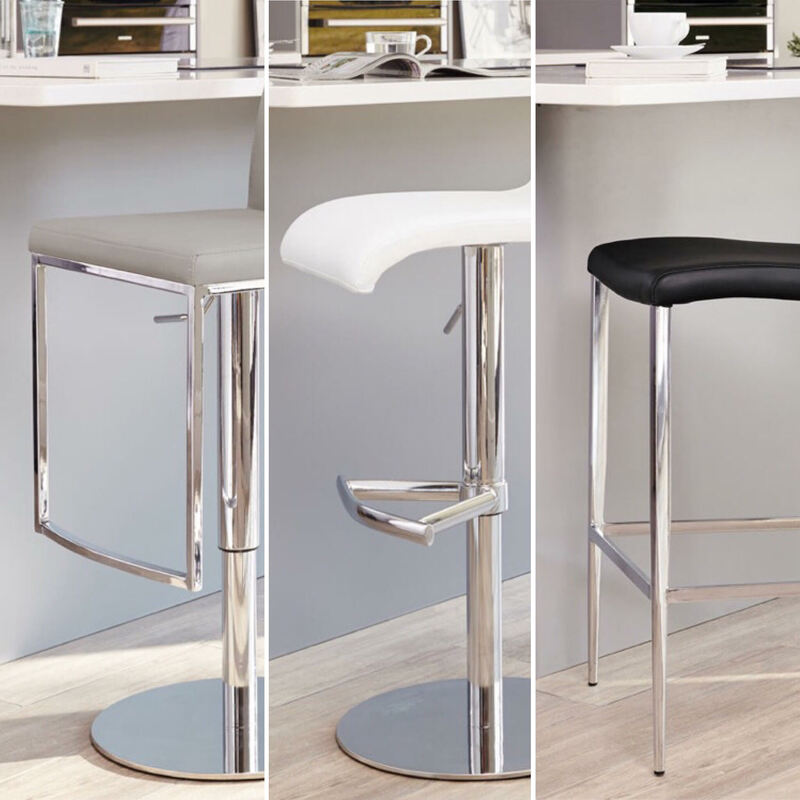 We have barstools that would be ideal for family living, all our real leather, plastic and faux leather bar stools are wipe cleanable and very durable making them more hard wearing than fabric bar stools which might stain more easily. All of our bar stools have a step up so they are ideal if you have small children that need a helping hand to get onto the seat. 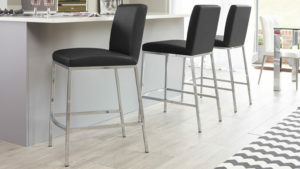 Perhaps you have a minimalist space and you are looking for a bar stool that will look elegant and stylish. We have some really contemporary white real leather and faux leather bar stools like these super luxe, white, pure leather Monti Bar Stools. 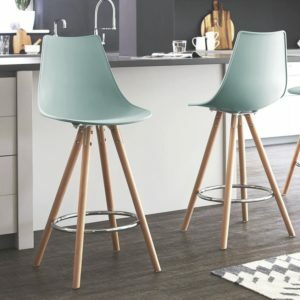 If you are after something more quirky and your style is more eclectic than perhaps the iconic Eames Style Bar Stools would work well and they are available in a selection of stunning colours. Danetti can help you with your selection. What kind of bar stool are you looking for? Do you want the bar stool to be fixed or a swivel gas lift bar stool? A fixed bar stool is stationary and a swivel bar stool well...swivels! All our swivel bar stools are gas pump bar stools with flat bases which is usually an indication of quality and they are ideal if you are catering for all ages as a simple gas lever under the seat area allows you to adjust the stool height simply and quickly. How? Simple! The lever simply opens a valve and allows the air in the tube to either go up or down depending on whether you are putting weight on the stool or not. And what finish do you want? Well, the finish will depend on what sort of usage they’ll get. If you are using your barstools everyday then you will find that our real leather, faux leather and plastic barstools are all hardwearing and very durable. Is it just for perching or will you be eating most meals at these stools? If you are eating at the bar it would be good to perhaps go for faux leather and plastic as they are wipe cleanable incase of any spills. And, obviously you also need to work out your budget...which isn’t a problem at Danetti as we offer stylish solutions at great prices. 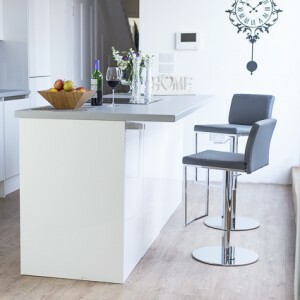 Whatever size the space you have, we will definitely have a bar stool to suit your needs, even if it's a bar stool that can be used as a useful chatting perch whilst someone else cooks! 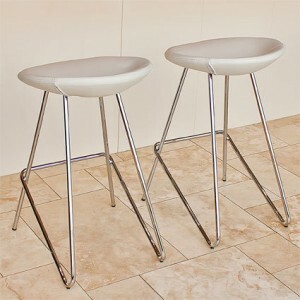 We are convinced that bar stools are a great addition to any home. If you are short on space, it’s best to choose ones that don’t have a backrest so you can tuck them neatly under the bar. Gas lift bar stools are usually on a pedestal base so they take up less room too. 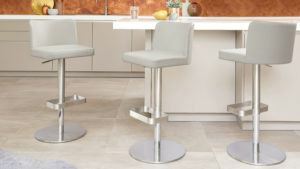 When you are planning out your space, remember to account for the barstools footprint as some have a wider bottom half. If you happen to have lots of space and your barstools are going to be used as your main dining seating it would be good to get the most comfortable option you can afford. Perhaps in real leather with a backrest - if your budget will stretch to it. A deep seat will also give an opulent luxurious feel turning your lounging area into a dining area. 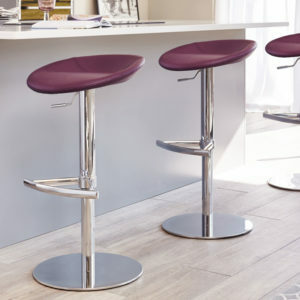 It’s worth remembering that Swivel bar stools need more space for their swivel-ability. So to help you plan out your bar stool area - have a look at this size guide...you can find out the dimensions of all our bar stools online. Determine the best seat-width choice for your bar or counter-height table. A bar height is generally for higher bar areas and a counter height is lower, more typical of a kitchen worktop counter height usually found in kitchen/diner areas. Be careful to double check this height as they are different. This is a very general guideline but would work for most bar stools although you need to allow for the angle of the seat, the depth of the seat but generally these measurements apply. 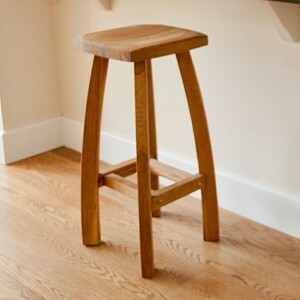 A counter height bar stool is generally 58-71cm from the floor to the seat (58-71cm seat height) and should be used with tables that are 88-93cms high. 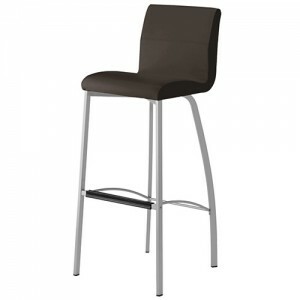 A bar height stool is generally 73-81cm from floor to the seat (73-81cm seat height) and should be used with tables that are 104-109cm high. 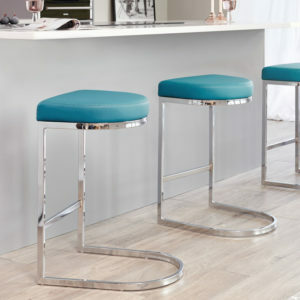 An extra tall bar stools is generally 83-91cm from floor to the seat (83-91cm seat height) and should be used with tables that are 112-120cm high. Heights are generally 71–76cm from floor to seat. Oak Bar Stool - Whilst everyone is falling in love with contemporary styling, we still enjoy the simplicity of more classical products. Our Oak bar stool is a combination of modern styling with a traditional material. The oak bar stool is solid chunky design with a modern twist and with a step up is ideal for families with smaller children too. 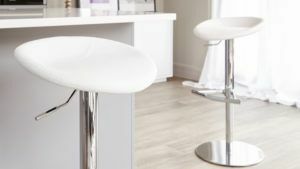 Elise Bar Stool - The Elise Bar stool is effortlessly glamorous with its gentle curved back and hardwearing wipeable faux leather, it is one of our favourite stools. 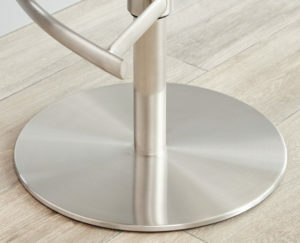 The highly polished tapered legs add an elegant touch and will add a touch of sophistication to any setting. Eames Style Bar Stool Bar - This is a design classic which been brought up to date with our choice of mid century inspired colours. These iconic bar stools are available in a palette of muted tones with a few bright accent colours that you can choose from to combine with your existing interior. The plastic seat makes it easy to clean and very durable and the sturdy design is reinforced with rubber washers between the fixings to ensure no squeaking! 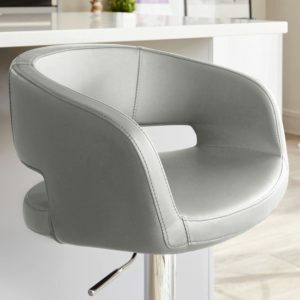 Curva Gas Lift Bar Stool - If you are looking for a super stylish but uber comfortable stool with a backrest, the Curve is a perfect choice! It is not only elegant and luxurious to look at, but the hard wearing faux leather makes it ideal for a bar stool as it is very durable and wipe-cleanable. 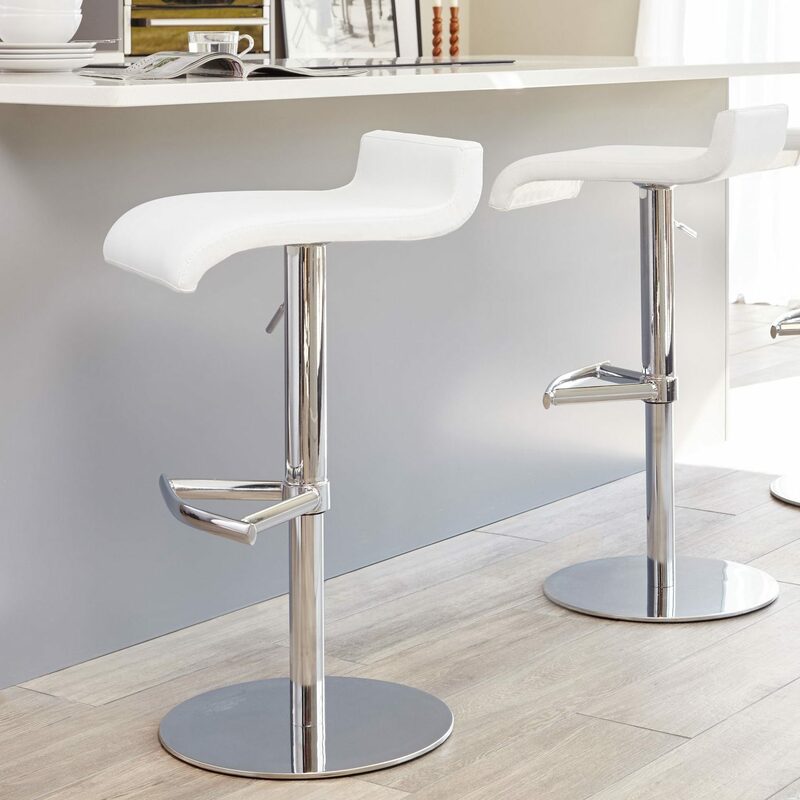 The stool has a chrome pedestal with a modern flat round base and attractive footrest, it also has a gas lift mechanism which makes the stool fully adjustable to cater for all sizes! Fondi Brushed Steel Gas Lift Bar Stool - These lovely little stools have a streamlined designer feel, with a small backrest for a little support and a gas lift mechanism for flexibility. The Fondi stools are really good in small spaces too. 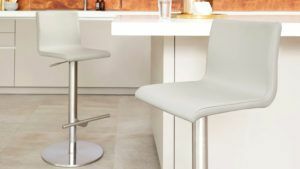 Candess Bar Stool - A stylish elegant curved stool available in luxurious faux leather or soft tactile split leather, the stool is available in seven colours. It is a simple design with a chrome pedestal with a round base and has a gas lift mechanism which makes the stool fully adjustable. 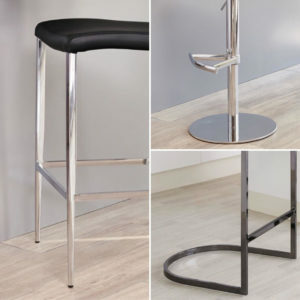 We love the stylish elegant curves of the modern Candess Gas Lift bar stool - they are the ultimate in a quality bar stool. Bar Stools – Perfect for Busy Families! 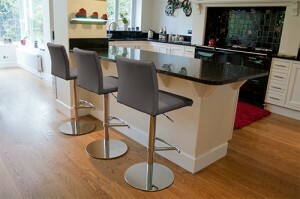 Bar Stools are the perfect solution for a busy family kitchen. The way we use our living spaces has changed over recent years, with many families opting for Open Plan re-designs. 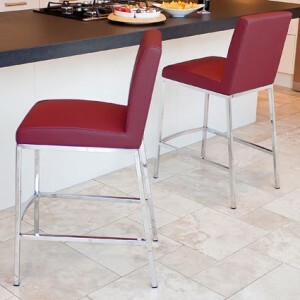 Bar Stools at a breakfast bar or island unit are great for busy parents who want to help the children with their homework whilst cooking the dinner, or for perching with a glass of wine whilst the 'other half' cooks! 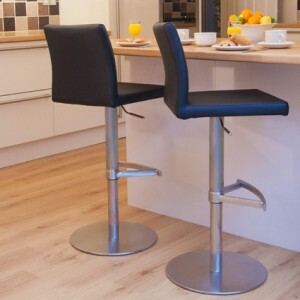 If a breakfast bar or island unit is your main dining area it is always worth splashing out on comfy bar stools so that you can sit in comfort and eat your dinner! 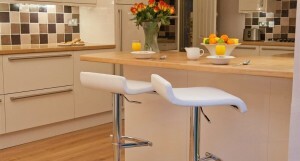 The Oak Bar Stool is a modern and very popular breakfast bar stool. 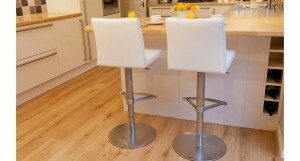 These Oak Bar Stools look fantastic in a traditional or modern kitchen with oak cabinets, but also look very contemporary in a cream Shaker style kitchen. 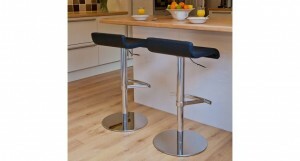 The legs and footrest add strong support to the stool - the footrest measures 200mm from the ground. Please note: We do not recommend that Bar Stools are used by young children or without adult supervision. Is 'Grey' the new 'Black'? We think so! Grey is quickly becoming one of the most popular colours in furniture and we find grey pieces are always requested by our customers! 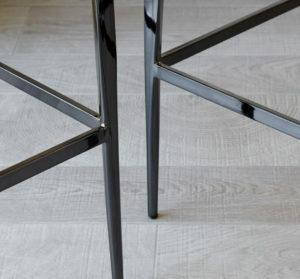 Here's a guide to our favourite grey bar stools in our range. The stylish Larino Bar stool has a unique Z shaped sleek chrome frame and a comfortable chrome finished footrest, perfect for perching on. The padded seat adds extra comfort and is beautifully upholstered in high quality soft faux leather in Putty Grey or alternatively Classic White or Black. 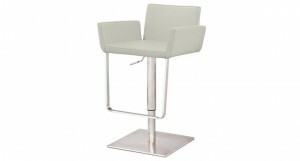 The modern Teora Bar stool offers excellent comfort, style and great value for money! The contemporary bar stool has well proportioned wider seat to add extra comfort. The padded seat is upholstered in luxurious but durable faux leather in Putty Grey or Bright Ruby Red. The sleek legs and footrest are finished in stylish chrome to create a sophisticated look. 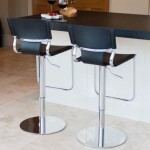 The shapely Elise Chrome Gas Lift bar stool represents comfort and value for money. The stylish bar stool is upholstered in durable but soft faux leather in Putty Grey, Classic Black, Cool White and Trendy Cream. 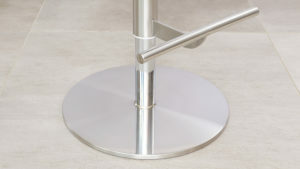 The chrome pedestal has a flat round base, measured at 420mm and a gas lift mechanism to ensure it is suitable for all! 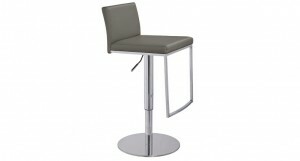 The Elise Bar Stool is also available in a Stainless Steel pedestal version. The Nicci Gas Lift Bar Stool has a classic chrome pedestal and the gas lift mechanism, which ensures that the bar stool is suitable for all. The Nicci Bar stool is unique with it's hanging footrest but the square flat base ensures stability and durability. The padded seat creates comfort and it is beautifully upholstered in soft faux leather in either Putty Grey or Bright White. The Yeppon Modern Leather Bar Stool has a soft real leather upholstered padded seat and backrest which makes this stool very comfortable. The stylish bar stool is available in a wide range of fashionable colours, the most popular colour being Dark Grey Leather. 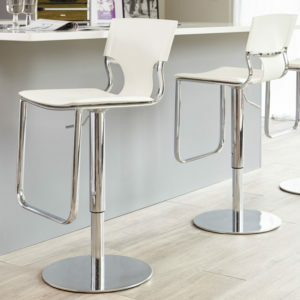 The trendy bar stool is supported by sleek chrome legs which are curved to give extra interest and the frame height is 650mm. 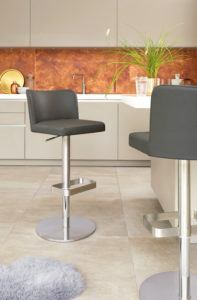 The stylish and modern Italian, Candess Bar Stool is upholstered in your choice of either luxurious faux leather or soft and tactile split leather in a range of classic colours: Charcoal Grey, Black, Dark Brown, Beige, Orange, Ochre Yellow or Ivory. The sleek frame is either finished in polished chrome or matt aluminium lacquered metal. 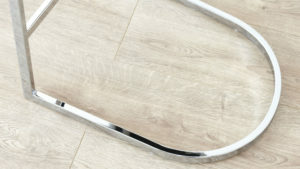 You can also choose from two fixed heights: 650mm or the higher 750mm. A simple yet stylish bar stool with separate seat and back rest. 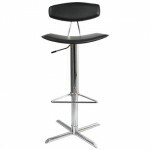 This classic bar stool comes with a gas lift system, triangular footrest and cross shaped base. Available in regenerated leather in Black, Red or White and Oak or Walnut wooden veneers. If you are looking for a funky, Italian inspired bar stool, offering great comfort, stylish good looks, all at a great price, then look no further. 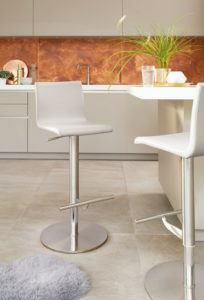 The exclusive Rocca Funky Brushed Steel Bar Stool is right up your street! 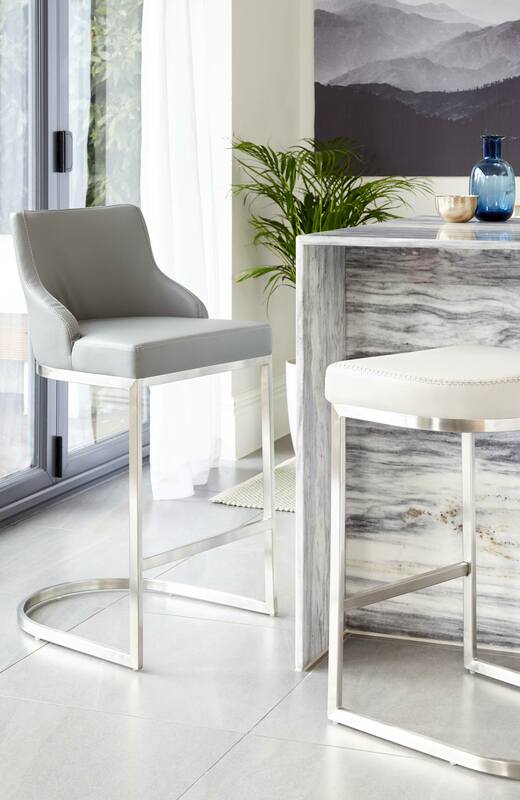 This stylish, modern bar stool is upholstered in hard-wearing yet luxurious faux leather in a choice of cool, modern white or classic black. The low backrest and armrests look fabulous but also provide extra comfort and support, with the hanging footrest completing the designer look. 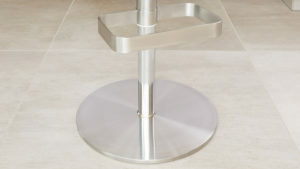 The brushed stainless steel pedestal, with a low profile solid metal flat square base, has a gas lift mechanism to make the stool fully adjustable for your requirements. The pedestal comes in brushed metal which complements the stainless steel in many modern kitchens perfectly.